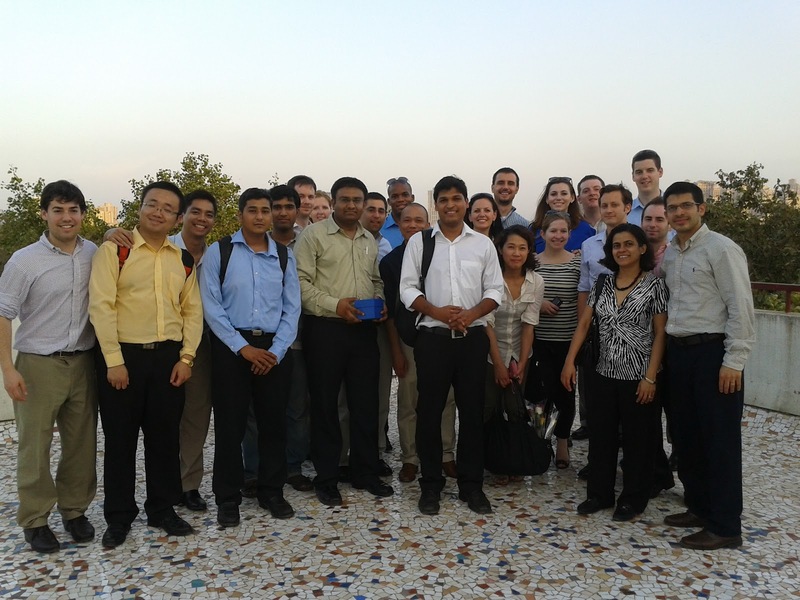 SJMSOM hosted a group of 25 students from the George Washington University School of Business on 15th May 2012. The visit was part of the itinerary of their international study tour. The group was led by Prof. Anu Phebe who is an IIM A alumnus and teaches international business at GWU accompanied by a student coordinator of Indian origin who hails from Hyderabad. Prior to their visit to SJMSOM, the group had met Mr. Niranjan Hiranandani, (Co-founder and MD, Hiranandani Group) and they visited some of the companies operating in Hiranandani area. At SOM, they were welcomed by our HOD, Prof. Karuna Jain, accompanied by Prof. Arti Kalro, faculty coordinator of International Relations team, Prof. Trupti Mishra, Prof. of Economics and Prof. Shishir Jha, Prof. of International Business and three students from SOM13. Prof. Kalro introduced the dignitaries to the students of GWU and gave a brief introduction about SJMSOM. She was joined by Prof. Karuna Jain who gave a snapshot about the history of SJMSOM, its mission and vision and achievements over the last 15 years. This was followed by introduction given by each student of GWU and SJMSOM. Thereafter, house was open for question and answer. 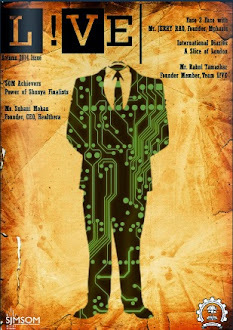 Students of GWU got their questions answered by the faculty and the students of SJMSOM. The interaction began with a question by one of the GWU students about the business model followed by SINE, entrepreneurship incubator of IITB. This was addressed by Dr. Jain who highlighted the achievements of SINE and linked the E-Cell, E-Club, Techfest and Avenues to entrepreneurship initiatives on campus. There were some other thought provoking questions like “What edge Engineers have over people from other disciplines as managers?” about the industry interaction opportunities at SJMSOM and about the competition SOM is facing from upcoming and established B-Schools in India. There was a question about the difference in context of business between India and US, which was addressed by Prof. Shishir Jha. He talked about the success of Indian biggies like Tatas and Birlas who have had a phenomenal success abroad. There were plenty of other questions in the mind of the GWU students about India in general which were taken up by SOM’13 students during high tea. The interaction session was followed by a campus tour aboard the Tum Tum. The first stop was the beautiful lakeside. Its beauty was admired by all the GWU students who found the breeze very soothing. The group was apprised about the diverse ‘Wild Life’ we have on campus. They found it very fascinating to co-exist with such rich flora and fauna. Next stop was H14 roof top. 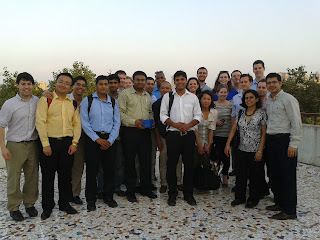 The group was amazed by the breathtaking view of the skyline at the back drop of the Powai Lake. Snaps were being taken at random as the GWU students couldn’t resist the beautiful sight. After spending some time atop the H14 roof, the group was escorted back to their tourist bus. Due to paucity of time, the campus visit came to an abrupt end. But, they were happy and satisfied with SOM’s effort at hosting them and they admitted that they had a lovely time. This experience is one of the few concrete steps that SOM is taking to foster its international relations with B-Schools of international repute.